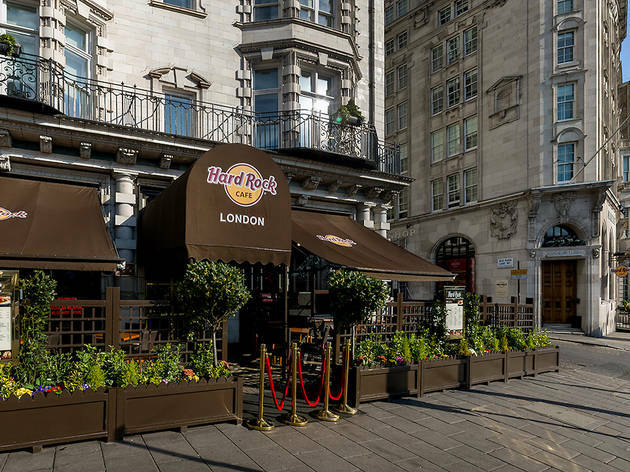 Please contact The Hard Rock Café London to redeem this offer using your iVenture Card. We recommend reserving a table to avoid disappointment. The Hard Rock Café is a legendary brand synonymous with American casual dining and entertainment. Established in London’s West End in 1971, this is where the stylish elegance of Mayfair meets the rest of the capital’s society in a laidback setting. Relax in an environment surrounded by vintage rock’n’roll decor and enjoy a cool American Set Lunch Menu featuring options such as classic burgers, salads and a delicious range of popular signature dishes. Hard Rock Café London is tucked away on Old Park Lane, Mayfair, within an old Coutts Bank (Interesting fact: The vault once held the Queen’s coffers. It now holds precious rock’n’roll memorabilia). Ready to rock the menu? Then let’s roll. Have a rocking main of your choice with the Legendary® Burger, Grilled Chicken Sandwich, Twisted Mac, Chicken & Cheese Pasta, Chicken Caesar Salad or Veggie Burger. Wash it down with a refreshing soft drink, coffee or tea. When it comes to dessert, indulge with a LIL Brownie – a medley of vanilla ice cream and hot fudge on a chocolate brownie topped with fresh whipped cream. Enjoy it all while taking in famous pieces from the history of rock’n’roll such as Joe Walsh’s guitar. Check the website for upcoming gigs and specials. Don’t forget to visit the shop in the vault for a full range of eye-catching Hard Rock Café merchandise. Get to Hyde Park Corner station on the London Underground and it’s a short walk up Piccadilly until you come to Old Park Lane on the left. Of course, if you don’t want to walk, you can hop on any number of buses that will get you there quicker.